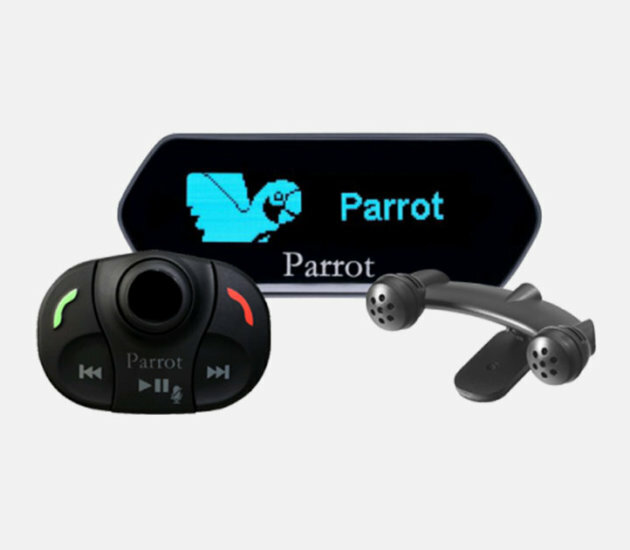 The Parrot MKi9100 system is a Bluetooth hands-free kit, with a removable OLED screen and a wireless remote. It lets you experience the road in a whole new way. At a glance, you can see all sorts of useful information: phone book, menus and settings, telephone status, simplified playlist, etc., while other features are easy to access with the wireless remote. ALL THE STANDARD PHONE FUNCTIONS AND MORE! As well as answering, hanging up or managing a three-way call, the Parrot MKi9100 offers advanced telephone functions. You can synchronise your phone book automatically, use voice recognition, have the MKi9100 speak names in your contact list, manage your contacts (up to 2000) and access your call history. With its OLED screen, you can see all the information you need: the caller’s name, the telephone’s content and certain settings that you have set yourself. PHONE CALLS – UNRIVALLED SOUND QUALITY! By combining dual microphone technology with signal processing software (DSP-3), all ambient noises disappear and your conversations are clear. The Parrot MKi9100 gets rid of all background noise to completely remove echo and interference, giving you optimum communication quality. Talk to your contacts as if they were in the room! The Parrot MKi9100 puts music at the forefront. A special cable adapts to all types of music sources – your smartphone’s Bluetooth, USB drive or MP3 player (iPod, Walkman, iPad, Galaxy Tab, etc.). There are no limits – you can take your music wherever you go, whatever phone or player you have! So that your hands stay on the steering wheel and your eyes on the road, the Parrot MKi system includes advanced voice synthesis and recognition features. Everything is automatic: the system recognises the contact’s name and calls them.